The North West’s premier waste removal and drainage company. Envirocare have over thirty years in the waste management industry, and are uniquely placed to help home and business owners across the north of England and North Wales keep control of their waste. From design, installation and maintenance to desludging, CCTV surveys and high pressure water jetting, our teams are equipped to offer you nothing but the best in drainage services. We’re also on hand to walk you through any drainage insurance claims you may have, and our no obligation consultation service ensures we formulate a plan for waste removal that suits you. We here at Envirocare seek to protect natural resources whilst developing effective and sustainable ways to manage waste. Throughout our years as a licensed waste carrier, we’ve developed partnerships that both preserve the local environment and enhance the surrounding community. We here at Envirocare hope one day to be the partner of choice for all waste water treatment application in the north west of England and North Wales. By offering solutions that are cost-effective, innovative and future-proof, we aim to provide our clients with solutions that benefit them not just in the immediate future, but for years to come. Through our partnerships, we seek to expand the range of services we can offer each client, ensuring that each and every customer gets a comprehensive service that’s tailored to fit their needs. We seek to contribute to the prosperity of the customers we work with by developing long-term partnerships that continually enhance the communities we work in. To achieve this, our team is constantly developing new solutions to waste management that improve not only the practice of our partners, but the lives of those living in the neighbourhood. We’re committed to the adding value to the communities and families we serve, and also to protecting the environment in which we operate. 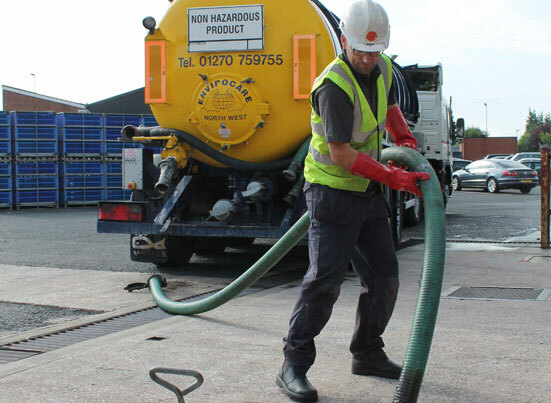 Our team are on hand to help with any waste disposal issues you may have, whether that be emptying your septic tank or desludging your grease traps. With over thirty years as a licensed waste carrier, there’s no issue we haven’t encountered before, and no problem we can’t solve. All our services are in-keeping with the latest Environment Agency guidelines, so you can rest easy knowing your business deals with its waste disposal in accordance with the latest regulations. With several offices across the North West, we’re always on hand when you need us. A complete design, installation and maintenance service to accommodate your treatment and drainage requirements. Liaison with regulatory organisations i.e. Environmental Agency, Planning Departments. Approved, accredited installers offering manufacturers support and backup facilities to satisfy environmental regulatory consent requirements. To find out more about our drainage services or waste disposal, call today on 01829 262 029!